After 23 dogs were dumped in Marion County on the morning of Jan. 24, a media storm ensued. The Enterprise, along with the Central Kentucky News-Journal in Campbellsville, and three different television stations reported the story, and $3,500 in reward money was offered for information leading to the arrest and conviction of those responsible for dumping the dogs. 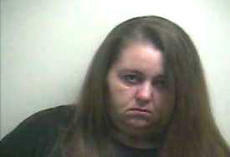 Pictured is Christina Gribbins, 36, of 173 Spurlington Road in Campbellsville. Last week, Christina Gribbins, 36, of 173 Spurlington Road in Campbellsville confessed to the crime, and she's been charged with 23 counts of second-degree cruelty to animals, according to Marion County Sheriff Jimmy Clements. She was arrested Tuesday, Feb. 7, and lodged in the Marion County Detention Center. She's being held on a $5,000 cash bond. She's scheduled to appear in Marion Circuit Court Wednesday, Feb. 8. Cruelty to animals in the second degree is a Class A misdemeanor. The penalty for a Class A misdemeanor is up to 12 months imprisonment and up to a $500 fine. Gribbins told Clements that she became overwhelmed with too many animals and abandoned 23 dogs on Highway 412 in Marion County. "Instead of asking for help, she opted to go that route," Clements said. While Gribbins is not licensed to operate a kennel or animal rescue, that's what she was attempting to do at her home. Gribbins claimed to be the operator of "A New Leash Animal Rescue" and she collected dogs from surrounding shelters and rescue programs. According to the Central Kentucky News-Journal in Campbellsville, Gribbins called the Taylor County Animal Shelter around 2 p.m. Thursday and asked that someone come remove some dogs she had at her home, which included 19 dogs living in outdoor kennels and five dogs inside her residence. The dogs were removed from Gribbins' home and taken to London by Stephanie Fields who operates "Homeward Bound," a rescue and rehabilitation center for dogs. Clements said he assumed Gribbins chose to drop the dogs off in Marion County because of the ongoing issues at the Taylor County Animal Shelter, which include allegations of burying dogs alive. State officials have dismissed those allegations. "She actually put two piles of dog food out when she dropped them off," Clements said. Gribbins is very remorseful for what happened, he said. "She feels bad about it," Clements said. Kay Turpin, Marion County animal control official, said Gribbins should have contacted a local animal shelter for help. Turpin said the real tragedy is that several of the dogs Gribbins dumped did not survive. Some were run over, and one froze to death. "We just wish she would have asked for help," Turpin said. "If her heart was in the right place she would have asked for help." Editor's note: Christina Gribbins is in no way related to Sarah Gribbins, Marion County animal control official.